The front of the postcard that Friends of the Pan Am Path is distributing for Spring!. 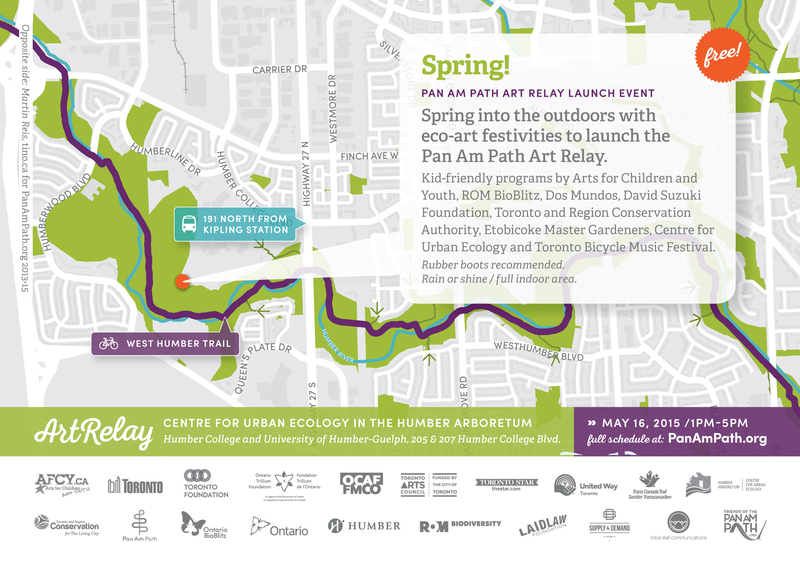 Of all the events happening around the Pan and Parapan Am Games this summer, the Pan Am Path Art Relay could be the most innovative example of what a mega-event can help bring to a city. The Art Relay starts this Saturday, May 16 2015. The first event, called Spring!, will take place at the Centre for Urban Ecology in the Humber Arboretum from 1-5 pm. “The major themes of this event are around young people, around art, and ecology. And there’s also an active living element thrown in there as well,” says Devon Ostrom, the Art Relay curator. Over the summer, fourteen relay events will take place on the 84km of City-run trails that make up the Pan Am Path. The finale, “Maadaadizi/Summer Journeys,” ends the Relay’s journey across the city in Rouge Hill. The week before each event, an insert in the Saturday edition of the Toronto Star will feature a map and information. Like every event on the relay, local community partners are helping plan and execute the event–in this case, the major partners are Arts for Children and Youth and the Humber Arboretum. The event will include an outdoors component, and rubber boots are recommended, but Ostrom says there should be something for everyone. A full schedule for the events, which begin at 11 am with a bike ride, is available here. The area of the Pan Am Path associated with Spring!. For the Friends of the Pan Am Path, this event has been years in the making. “[The Art Relay] is all about a grassroots, community-led initiative,” says James Gen Meers, executive director of Friends of the Pan Am Path. Meers was one of five DiverseCity Fellows who came together with Ostrom, a local artist, looking to connect Torontonians in different parts of the city. 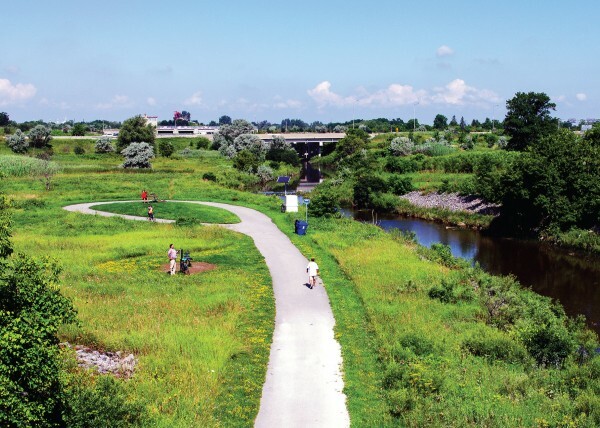 The City already had a ten-year plan to connect and improve existing trails. They also had money put aside to fund projects related to the Pan Am Games. “We saw a great opportunity to combine forces and try to leverage some of the resources that were being allocated for legacy projects to promote an acceleration of trail-building that was already on the city books,“ explains Meers. They thought that an arts event would show off Toronto’s local artists, who come from all over the Americas and elsewhere. “I feel like, as a resident of the city, we were never so divided as under the Ford regime. So we wanted to connect the city, not divide it,” he explains. That mission — linking Torontonians from different geographic, financial, and cultural backgrounds — has been the organization’s heart from the early days, when they went out of their way to solicit applications in four different languages. They also specifically requested applications that were in their preliminary stages, not fully-formed submissions. “We did that because we wanted to minimize access costs, and make it so anyone could participate or put forward an idea,” says Ostrom. With most open art calls, he explained, the expectation is that an artist will fully develop their idea on their own time. But the Friends of the Pan Am Path wanted ideas from everybody who was interested in participating, not just the people who’d have time to create a full proposal. This approach provoked over 230 applications. Fourteen of those form the basis for Art Relay events, and Ostrom is hoping that some of the others might be used in the future. This mural will be officially unveiled at the second Art Relay event. 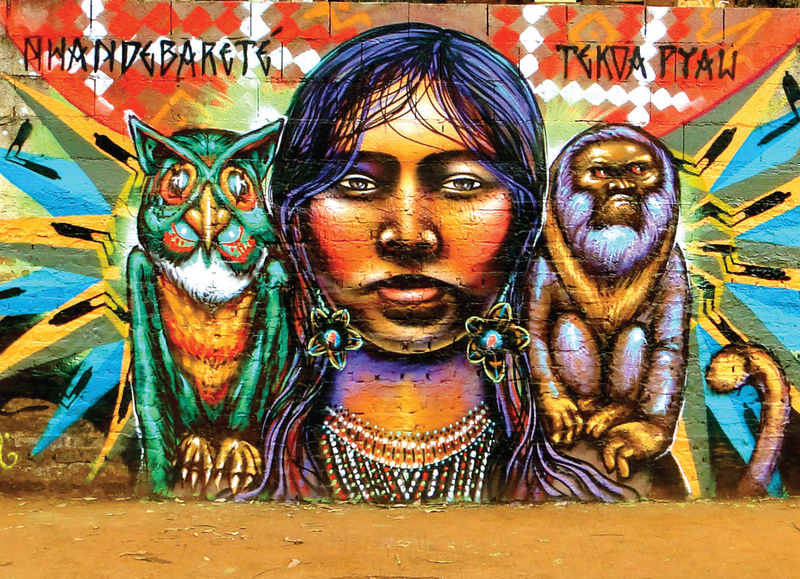 After the relay is over, some art provoked by the Arts Relay will remain: murals across the city, a mosaic under the Dundas West bridge, and a new gallery of Latin American art. More important, say Ostrom and Meers, are the legacies of connection they hope the series will leave behind, between artists at the city’s often-ignored periphery and between trails in the city. For the Pan Am Path to come together, only a few kilometres of trail needed to be built, connecting existing trails. Most of the Path is made up of existing city-owned trails. Organizers acknowledge that three short sections won’t be finished in time for this summer, but they say the Path will work without them. The Pan Am Path isn’t going away after this summer’s festivities, either — Friends of the Pan Am Path recently announced they received $1 million in funding from the Toronto Foundation to continue work. “Our board of directors is already starting to bring in a legacy plan around both the next ten years and some other major events that are happening,” said Brent Chamberlain, the organization’s chair. As the polished promotional material and impressive roster of funders attests, the Pan Am Path and the art relay have gotten significant buy-in from organizations in the city. Friends of the Pan Am Path’s mission statement hits a lot of Toronto’s biggest issues: divides between downtown and the inner suburbs, transportation, and urban planning that creates connections between different parts of the city. That might be why there’s been so much interest in seeing the organization succeed.